When sharpening axes, it is important to keep the wedge angle suitable for the type of axe and usage. Cutting axes, used for example for felling trees or limbing, have a slim, double-bevel blade with a relatively acute cutting angle of 20°-25°, while split-ting axes have strong and heavy blades with a relatively shallow cutting angle of 25°-30°. The wedge shape of the blade (curved or straight) is also important. Heavy-duty axes (e.g. 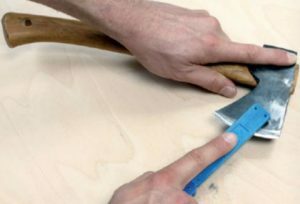 felling axes, splitting axes) have a curved blade, while axes used for precision work, such as carpenter‘s or sculptor‘s axes, have a straight blade.